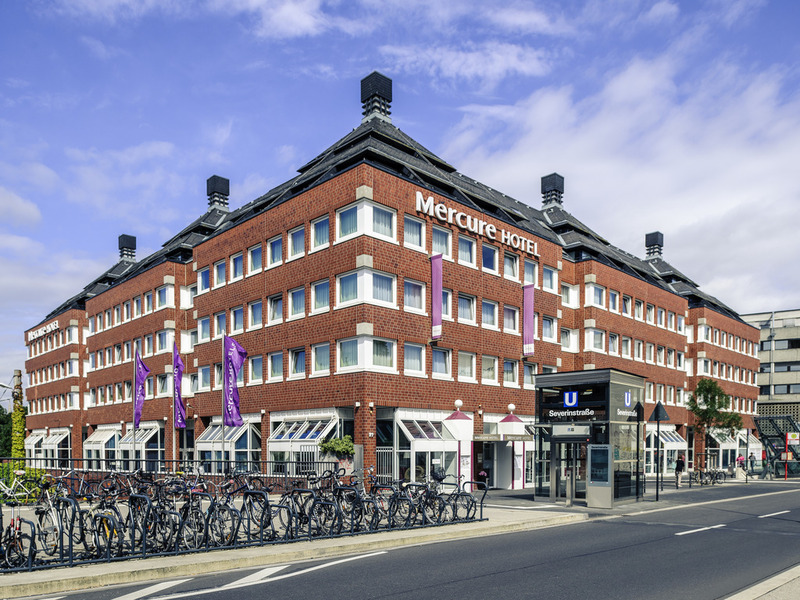 Mercure Hotel Severinshof Cologne City. Book now! The 4-star Mercure Hotel Severinshof Köln City is right at the heart of the lively metropolis, in the popular Severinsviertel area. In just a few minutes, you can reach the old town, cathedral, main train station, Lanxess Arena and exhibition center. The hotel has 253 modern non-smoking rooms with free WIFI. We have 6 rooms that can accommodate up to 200 people available for your event. At RELAX - FOOD, DRINKS & YOU, you can eat and drink in a relaxed lounge atmosphere with a large sun terrace. The cathedral is of course a must. An art enthusiast? Then visit the first-class Cologne Museum. The banks of the Rhine are perfect for a stroll and you will quickly get to know the warmth of Cologne's inhabitants in many of the city's cafés and bars. We wish you a pleasant stay at our 4-star Mercure Hotel Severinshof Köln City: Our 253 air-conditioned rooms, including 16 luxurious suites with a kitchenette, are well-equipped and offer free WIFI. Some of the Some rooms overlook the hotel's peaceful inner courtyard. Privilege Rooms with a balcony and Superior Rooms are also available. One child up to 12 years of age can stay in your room free of charge on request. The junior suite was perfect for us, very clean and daily maid service and fresh towels. Central with trains accessible and walking distance to many parts. Lovely breakfast, also friendly staff. I am usually not a good sleeper but had such good sleeps here. The room was really nice and big. We really enjoyed. Due to only one night of stay, we did not have the time to test the gym and sauna. The food in the restaurant for dinner and breakfast was good and tasty. The general service and employees were very friendly and supportive. The hotel and the staff were amazing. I very much enjoyed staying here. The employees and staff could not have been more nice. My stay was 5 nights and everything was lovely. There is only one small thing I would change about my experience, I really wish they had washcloths. I did ask at the front desk but the smallest towel they have is a hand towel. Otherwise, fabulous! Great location too, within walking distance of many points of interest as well as restaurants and bars too. I did eat a few meals at the hotel and all were great! I arrived only 40 minutes before the usual check-in time but I was told that I have to return at 3:00pm because the room is not ready. I explained that I am a member of Accordhotels and if possible the room be prepared earlier which was rejected straight away. Service staff was very friendly and competent. The food in the restaurant was good as well. As to the room: 1) The safe deposit box was not functioning (empty battery?) 2) The bottle with shower gel inside of the shower was empty. 3) As part of the online check in, I have entered data with respect to the billing address. As already many times before in other Accor hotels, also this time, the hotel staff did not have any information of the billing address in their computer 4) As in many other Accor hotels, also this time, the hotel staff could not see that I had already made a reservation for breakfast. It took a while to figure out for them. As to the breakfast: 1) It looked like personnel was overloaded. When I arrived at breakfast at 7:45am, there were no tables ready for seating. All were covered with used plates, cups and cutlery. Good hotel for a citytrip. We had a big and clean room. Quality of the pillows is poor. Staff is very friendly. We did the online check in for the first time but when we arrived in the hotel we had to check in again. (fill in all our personal information) So that went a bit messy. Rest of our stay was perfect! also check out went very fast. We should get the invoice in our mail, but so far we haven't had the invoice jet. Very modern hotel that was comfortable with friendly staff. Room was spacious, clean and comfortable. Staff were friendly and helpful. Due to the design it was not easy getting in and out of bath. We did not eat breakfast due to the high cost. When booking the hotel online I did not realise that city tax was not included, so being charged on checkout was a surprise. Overall was good. Location and cleanliness are the best asset to this hotel. Some receptionists are good others need to learn how to smile and learnt a bit more about customer service. Every one who works there is higtly trained and will do everything the guests need and are always happy to help no matter what you need . Bedding was excellent (feel at home). Enough room for two to manœuvre within the room. As usual, your personnel attitude is top notch. Our spot in Cologne! (we go once at least once a year: it is a city that, with its size and feel makes us think of Montreal. The hotel is well located, the stuff is pleasant and we enjoyed our stay in Köln. The reception staff is not unwelcoming. Nobody takes time to explain slowly in english where is the mercure park. The tourist taxt to Koëln is very hight. It's very stranger, the waitress said it wasn't the room service on friday evening??? My stay at Mercure Hotel was good, the personal is very nice and helpfull, the breakfeast hat a large variaty of options. What I don't understand is why, if the rezervation is on my name but i booked through an agency I can't get any point, there are still my money and my option to stay at the hotel. I have a lot of meetings and stuff to do and don't have the time to book a room directly from your website or app, i do however work with an agancy who does everything for me, room booking, flights, train, and so on. I have also a member Card from Marriott and there as long as the room is on my name it doesn't matter how i have booked it or paid for it. Please try to fix this and change it. I don't find it normal. Probably I will choose a Marriott hotel next time in order to book it also through the agancy. I would have give a 10, if i could also receive my points.